This is the third in a series of posts on grid energy storage. Earlier, in Energy Storage 101 and 102, we attempted to elucidate the applications of energy storage for various customer types and discussed the technologies and value chain. In this post, we examine the economics of behind-the-meter (BTM) storage for commercial customers. We model the returns to a hypothetical commercial BTM storage customer in New York City, San Diego, Honolulu, and Des Moines. We show how it is possible to optimize returns by sizing the battery intelligently with a software model. For economy, we use the term “commercial” here to represent any non-residential end user of electricity, including commercial enterprises, schools, non-profits, government entities, etc. Also, we assume the host is the owner of the storage system. Storage can be used for peak shaving and/or backup power. Many buildings already have segregated wiring for systems they want running in case of an outage (e.g. elevators or emergency lighting), but in most cases a battery designed for peak shaving will not have enough capacity to run an entire building. Here, we focus here only on the economics of peak shaving only because modelling the value of back-up power relies heavily on the importance of continuous power to a specific building. 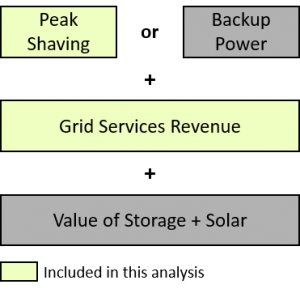 In some markets, storage can also generate grid services revenue. For example, a storage system owner could sell frequency response services to an ISO or “generation” capacity to a utility. Finally, storage could create value in conjunction with solar if storage would allow a larger solar system than would otherwise be allowed or economic and solar is otherwise less expensive than the grid. A battery system installed together with solar would also be eligible for an investment tax credit (30% through 2016, 10% thereafter). For simplicity, we don’t consider solar + batteries in this analysis. We will come back to this in a future post. This is the second in a series of posts on grid energy storage. In Energy Storage 101, we discussed how various customer types can benefit from storage.In this post, we discuss key storage technologies and identify the economic value chain for battery storage. Next week, we will examine, in detail, the economics of commercial behind-the-meter storage in Energy Storage 201.